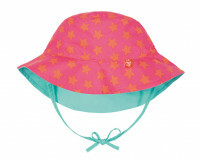 The Peach Stars bucket hat can be worn on both sides and protects sensitive skin on a baby's or a toddler's scalp due to the UV proction of 50+. 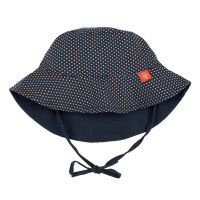 Product information "Sun Protection Bucket Hat Kids, Peach Stars"
description & equipment It never gets boring with this sun hat! Our reversible bucket hats provide two different colors/designs in one! To protect babies and toddler’s sensitive scalp, LÄSSIG headgear features UV protection of 50+, making it perfect for playing in the sun. Handy ties keep the hat in place while little one’s are on the go. Made from fast-drying microfiber.